In 2006 I was near Asheville, North Carolina, and on a whim, Marty Duren, Kevin Bussey, and I went to the home of Billy Graham in Montreat, North Carolina (Black Mountain). I had known Franklin Graham since 1992 when he preached a week-long evangelistic crusade in Enid, Oklahoma, but I had never met his father. When we arrived, coming out of the massive gate at the front of an iron fence - a fence built by J. Edgar Hoover as a favor to Mr. Graham - was a Graham family member (a niece). She said that her uncle was feeling ill and had lain down to take a nap. She suggested we go to his office in Montreat and that Mr. Graham's assistant would see if we might be able to meet Mr. Graham later that afternoon. Upon arriving at the Billy Graham offices in Montreat, we walked in and Mr. Graham's assistant greeted us, then surprised me by saying- "Wade, I read your blog regularly." I discovered that though we'd never met, we had several common connections. For the next hour, we were regaled with stories about Mr. Graham, the meetings that had been held in his private office over the years (the office pictured where Mr. Graham is standing in the portrait to the left), and various other personal anecdotes that I will always treasure. We were able to take several pictures and ask even more questions. It was an afternoon I'll never forget. Due to Mr. Graham's illness, we were unable to meet him that day. However, within a couple of weeks, I received in the mail his autobiography with a personal note attached. I have since read Mr. Graham's autobiography on at least three occasions and am moved every time I read it. Evangelist Billy Graham has touched this world in a way that generations to come will remember with fondness. When I heard of his passing this morning, my thoughts went out to his children, grandchildren and extended family. An era good for our country has come to an end. I pray for His family. Truly a humble servant. Wade I have always believed you too be like him. Maybe it's your turn. Much love and thank you for this ministry. I miss this church. Very sad news, but the good servant is now with his Lord and there is no more suffering for him. We loved this man who loved the Lord Christ and who preached Jesus Christ Crucified and Risen From the Dead. May God receive the soul of Billy Graham into His safe keeping and may perpetual light shine upon him. At one of his revivals, he asked those to stand who wanted God’s will in their lives. I was one of the many that did. My sisters had one thing in common with him; they all got kicked out of Bob Jones University. That University had rules that would have made Pharisees wish they had thought of them. When Billy Graham started to preach on the radio and on tv, we were cautioned in school to not listen to or watch him as we were Roman Catholics and he was a Protestant. However, two of my aunts (nuns who have long since passed away) said that they used to get together with all the other nuns at their convent and gather round the tv to watch him. When they came to visit my mother, we too, turned on the tv to watch Billy Graham. I was confused as to why we were told to avoid him since his gospel seemed so simple and straightforward as opposed to the complexity of Roman Catholicism. So my family did have some exposure to the Good News and I have fond memories of the apparent joy on the faces of my aunts as they watched and heard the crowds sing "Just as I Am." An end to an era but not an end to my fond memories of him and his simple preaching of the Good News of Jesus Christ! a true story. . . The Polish Catholic Cardinal Wojtyla invited Billy Graham to come to Krakow and to preach in the Catholic cathedral in Krakow. And Billy Graham came to honor that request. But something happened. Cardinal Wojtyla was suddenly called to Rome and into 'conclave' because the Pope had died and a new pope was to be chosen. Cardinal Wojtyla entered into the 'conclave' and was chosen to be the new pope who took the name of John Paul II. It's a strange, but true story. These two men from different traditions shared one especial love for the preaching of Jesus Christ Crucified and Risen From the Dead. They remained friends for the rest of John Paul II's life. The Holy Spirit goes where He wills. And there are no boundaries that are able to divide those who love the Lord from one another and who dwell in the protective shadow of the Holy Spirit. If there is ever ANY union between Christian people, it is found only IN CHRIST. It is in their shared devotion to Our Lord that John Paul II and Billy Graham were able to meet 'as brothers'. Catholics loved Billy Graham. They recognize in him a true 'Servant of the Word'. He is with the Lord and at peace. I stand corrected about Billy Graham being kick out of Bob Jones university. I and my two sisters attended a revival that Bob Jones held in Dallas. He wanted them to attend his school. Oldest sister said she would need a job and had experience by helping our father in making school annuals. Jones said she would be paid to help with their school annual. She was a freshman and workers on the annual had to be juniors or seniors. She worked in a café making hamburgers. After younger sister was disciplined many times for breaking rules, older sister wrote a letter to Dean of Women suggesting the school needed a ‘student council’ to handle discipline problems. Amazingly, in today's Atlanta Journal daily newspaper, almost the entire front section was totally inundated with articles about Billy Graham and they ALL WERE POSITIVE AND SUPPORTIVE! The Atlanta Journal is not considered to be a "conservative" paper. 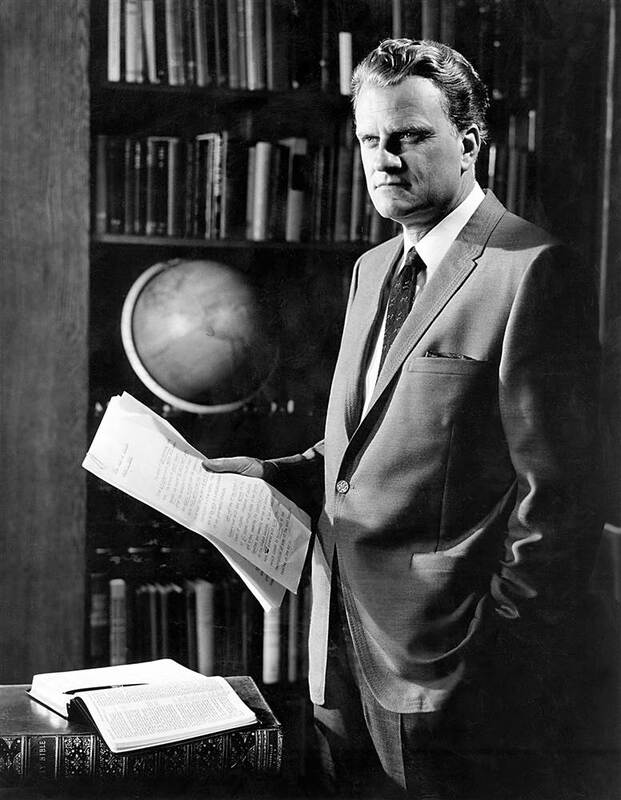 But in the case of Billy Graham, there appeared to be zero attempts to slant his life or ministry in any way to facilitate a political agenda of the paper. Is there any one person in the nation that could have such a reputation as being objective, humble, and focused on his message about Jesus Christ while equally applying it to all without regard to their politics? I believe that he was the "one" prophet of our age (in terms of a prophet being a proclaimer of God's message"). There are no others.